They say that me in a maxi dress is me in my element, in case you didn't realize my obsession. It's what I feel most comfortable and confident in. For some people it's shoes or a magical pair of jeans, but for me, a dress inspires me the instant I put it on like I'm ready to conquer something. I felt right in tune with this Gypsy05 spaghetti strap maxi dress, because of its fun, detailed embroidery at the hem which emphasizes the ebb and flow of the dress. It's also made from one of the most splendid fabrics for summer, cotton gauze - super breathable, lightweight, flowy, and warm enough for summer nights. I can't imagine a more perfect dress for Coachella and beyond, so you'll most likely catch me wearing this over and over again for the next forever. 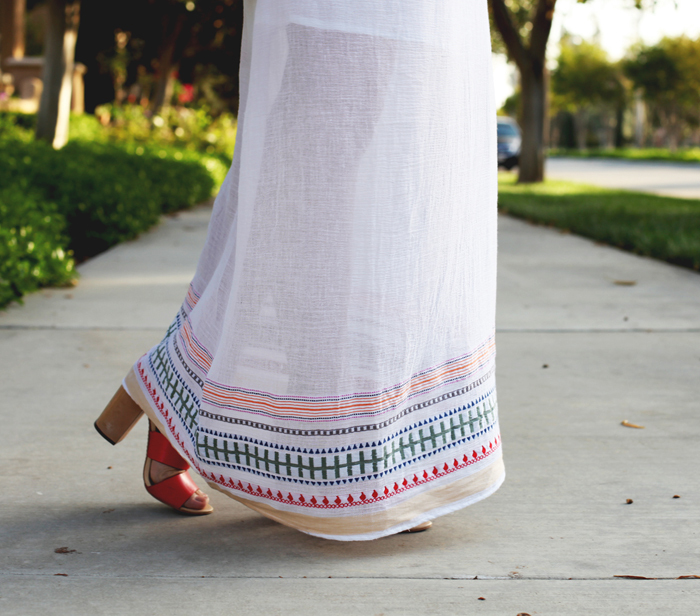 I love the maxi dress with the neat embroidered details. It is like your own take on the sheer trend that is so big for spring 2013! Super cute. Loving everything about this look. Head to toe! What a perfect dress for coachella and love the color of your sandals! You look stunning! I love that dress! wow that dress is so gorgeous! and i love these photos! really beautiful dress and I also love your heels! Stumbled upon your blog today and your already in my Bloglovin' reader. Great work dear, I am now a follower!